As a young man I accompanied my father to annual Native ceremonies in and around the Phoenix area as well as in the Mexican state of Sonora. Because our family was far removed from our ancestral lands of the Acjachamem in Orange County, California, my father wanted to expose me the many tribal groups in our area, particularly the Yaqui Indian Easter ceremonies in nearby Guadalupe, Arizona. It was during these ceremonies that I was first introduced to mask rituals. I was captivated by the power of the mask to transform. The fascinating story of the Native American Mask dance became an artistic obsession. My career as a professional artist began in 1972 when I had my first One-Man Exhibition of bronze sculptures and ceramic masks in Cuernavaca, Mexico. I went to learn the art of bronze casting and to study the Post Revolution Muralist Movement of Mexico. Under the guidance of Mexican master sculptor Francisco Zuñiga, I completed a collection of 20 medium size figurative sculptures. The underlying theme of my sculptures was the human condition, particularly the situation of indigenous people. I adopted the philosophy of art with a social conscious and adhered to the ideology of David Alfaro Siqueiros, while being profoundly inspired and motivated by the indigenous people, their art and culture. During the four years that I worked in Mexico, I lived in Tepoztlán, Morelos, a Náhua indian village. It was in Mexico that I first formed relationships with masks makers from the surrounding states of Guerrero and Michoacán. Fascinated by the rich cultural legacy of the mask in Mexico, I began a life time study of the Nahuatl Language, once the mother tongue of Ancient Mexico. Upon my return to the U.S.A. in 1974, I was appointed to the position of Artist-in-Residency at Stanford University, California for a 6-month period. During my stay I completed two major mural projects at Casa Zapata and began my career as a poet and performance artist, giving music presentations at colleges and universities in Northern California. The American Indian Movement and the Chicano Movement were an inspiration to me at that time and guided me along my journey on the “Red Road”. In 1975 I returned to my native Arizona to work as community muralist for the Arizona Commission on the Arts CETA Program. I completed 30 murals in schools, housing projects and at Indian reservation locations. Back home in Arizona, I was able to connect and collaborate with native artists and activists. 1975 was the year I founded the Xicanindio Artists Coalition, Inc. a non-profit arts organization established to promote Native American and Chicano arts. 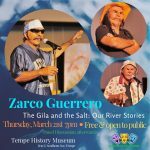 It is the oldest Latino and Native American Arts organization in Arizona. 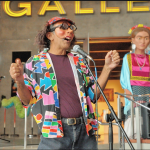 The painting of murals, community grassroots arts and the performances of Latin and indigenous music in schools became the main revenue producing function for Xicanindio. This non-profit organization has since grown to be a dynamic cultural force in the Phoenix area and the Southwest. In 1978, I traveled to Brazil and the Andean countries of South America to research indigenous art forms, ceremony and rituals. In 1979, I returned to Arizona determined to further develop the mask art form and integrate its use in contemporary culture. As Artistic Director of Xicanindio, I initiated the Annual Día de Los Muertos Festival which has become the main venue for my mask making endeavors and it is celebrated on the last Sunday of each October in Phoenix, Arizona. The festival has become one of the most unique of its kind in the Southwest because of the extensive use of masks and has been celebrated now for over 40 years. The central theme of this celebration is to honor our indigenous past while resurrecting ancient mask traditions. In September 1984 P.B.S. 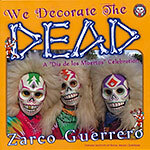 aired nationally a one hour documentary called The Mask of El Zarco. It focused on my work as a mask maker and provided invaluable exposure on a national and international levels. In 1986, I was awarded the Japan Fellowship from the National Endowment for the Arts and spent 9 months in Kyoto. I wanted to witness first hand a mask making tradition that had not been interrupted by colonialism. During my residency in Japan I was the personal apprentice of Joshun Fukakusa, a master of the Noh Mask. While working in Kyoto, I completed a collection of Noh masks and was able to exhibit my work alongside my sensei/teacher and his father, the National Living Treasure Noh Mask Maker Ujiharo Nagasawa. Intense study of the Japanese language enabled me to conduct extensive research in the area of Japanese masks and to visit many prominent artists, museums and collections of rare and ancient masks. I traveled to China and Thailand in 1987 to further my research in mask making. My travels in Asia were completed after 6 months of living in Bali, Indonesia, where I carved ancient archetypes with native carvers, most specifically Ida Bagus Sutarja, who was one of the few Balinese priest/maskers qualified to create sacred masks for ritual use. 1990 : I wrote Song for the Forest People, a tribute to the Indians of the Amazon Forest, which was performed by the Arizona State University Institute for Experimental Arts. The play, a dance opera, utilizes over 30 masks made of paper, fiberglass and carved wood. Another play entitled La Mascarada de la Vida, produced locally by the theater for young audiences group Childsplay, Inc., was highly acclaimed in Arizona and performed at the Kennedy Center in Washington D.C. In La Mascarada I played the main lead role, co-wrote the musical score and produced over 25 masks including a 8 foot tall puppet, the first in a series of processional sculptures. I have over a dozen of them now. In 1993, I was awarded the highest artistic recognitions in the State of Arizona: The Governor’s Arts Award based on my work in developing inner-city and reservation arts programs. A lifelong dream was realized in 1994 when I was commissioned to produce a larger than life bronze figure of labor leader César Chávez. The sculpture was the first such monument of its kind in the Southwest and a milestone for me as a sculptor. Cesar was recognized as a great labor leader and was also a member of the Pascua Yaqui tribe of Southern Arizona. At this point, my career took a drastic turn as I began to concentrate on developing a one-man masked drama called Face to Face in a Frenzy(aka F2F). I have performed F2F hundreds of times to schools, conferences and festivals. Mask Drama has become my main form of performance expression. I feel that this form of mask performance is unique and extremely effective in reaching large audiences. It has given me the ability to use the power of the mask to transform. With this power I am able to express my feelings and ideas in many ways that are just not possible with other forms of art like sculpture and painting. I believe it to be my true calling as a contemporary, socially conscious artist. It allows me to work outside the mainstream while contributing to the cultural life of my community in a creative and positive manner. In this performance I address many of the social issues that affect all people especially people of color. In March of 2008, I dedicated a life size César Chávez sculpture for the City of San Luis, Arizona where César was born and died, on the occasion of leader’s 80thbirthday. I was the recipient of a Doris Duke Foundation grant in 2013 to create innovative ways to reach wider more diverse audiences from underserved communities in Arizona. In 2015, I was recognized as a Master by the Southwest Folklife Alliance in Tucson, Az. 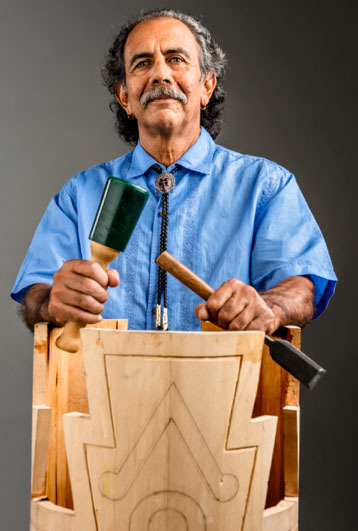 My goal for this grant was to make, carve and perform with traditional Aztec drums. The Phoenix New Times named me the “Best Storyteller” in 2016. 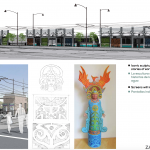 In 2017 I was chosen by Valley Metro to design the Light Rail Station at Baseline and Central Avenues in South Phoenix. Most recently I received the Water Public Art Challenge prize from The Arizona Community Foundation to create a 50’ cut out steel gate to be installed at the Pueblo Grande Museum in Phoenix. The Portal to the Past will honor the Ancient Sonoran Desert Peoples water legacy.